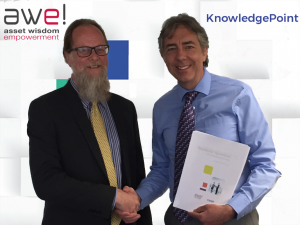 KnowledgePoint Engage becomes Asset Wisdom’s first Global Distributor of its full range of awe! branded learning and service offerings. Asset Wisdom are the creators of the awe! portfolio of Asset Management e-learning modules and the first to establish an online library of knowledge available ‘anytime anywhere’ in this area. Asset Management is the coordinated activities of an organisation for the realisation of value from assets. Asset Wisdom is BSI’s only ISO55k Associate Consultant and the Institute of Asset Management’s (IAM’s) only Endorsed Trainer for online learning. KnowledgePoint Engage are the entity that delivers professional training programmes on behalf of vendors. Engage develops vendor-led training programmes and initiatives, and manages regional distributors, taking responsibility for operations and reporting as well as funds management and the recruitment of partners. “We have been involved in the training industry for over 20 years, and this partnership means that we continue to bring learning to life for everyone with knowledge to share, as is our mission.” Paul Gibbons, CEO KnowledgePoint, goes on to say, “A number of our professional services consultants are working within the Built Environment where management of assets is key. The awe! Suite of Learning supports this requirement”.